Evelyn B. (Hull) Ray, 89, passed away Wednesday October 24, 2018. Born September 7, 1929 in Clay County, TN, Evelyn was the daughter of the late Hiram (Ed) Hull and Minta (Fannie) Bilbrey Hull. A longtime teacher and educator, she specialized in early childhood education primarily with 3 year olds. She taught at the Oak Ridge Nursery School from 1958 to 1984. 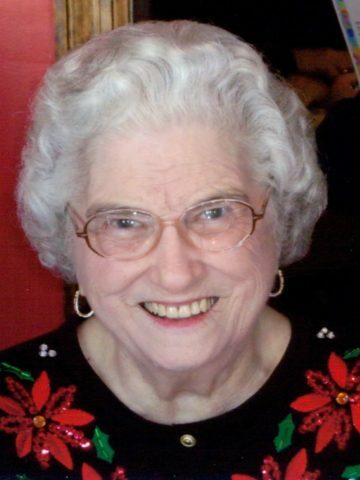 She was also an active member of the Beech and Oak Ridge Cumberland Presbyterian Churches where she sang in the choir for many years. In her spare time she enjoyed all sorts of crafts. Among her skills were her work in crochet and beadwork. She was a member of FCE (Family Community Education) and had judged many country fairs. In addition to her parents, Evelyn was preceded indeath by her husband, Ridley “Sonny” Ray, and a sister, Opal. She is survived by her daughter and son in law, Mary Sue and Mark Taylor; her sister in law, Gwen Ray; her brother-in-law, Charlie Ray; nieces, Davina Mason and Sharon Turner; and nephew, Jonathan Savage. Visitation for Evelyn will be held Sunday from 1 to 3 pm at Cole & Garrett Funeral Home, Goodlettsville, followed by a Life Celebration Service at 3 pm. A graveside service will be held Monday at 10:30 am at Crest Lawn Memorial Cemetery in Cookville, TN. The family wishes to thank Willowbrook Hospice, especially Victoria and Jessica, for their professional and compassionate care in Evelyn’s last illness and especially thank the clergy and members of Beech Cumberland Presbyterian Church and Trinity Episcopal Church for their love and support. In lieu of flowers, memorial contributions may be made to Outreach at Trinity Episcopal Church, PO Box 162, Russellville, KY 42276. Sweet Evelyn lived next door to my Mother before my Mother passed… she was a precious soul. She would make my Mother cornbread and buttermilk😍loved her dearly. So sorry about the death of your loved one. I am a member of Beech Church. Your in my thoughts and prayers. May God be with each one of you at this time.